When opening or running Windows Media Player (WMP) of any version, i.e. WMP10, WMP11 or WMP12, the following error related to wmploc.dll file may occurs. 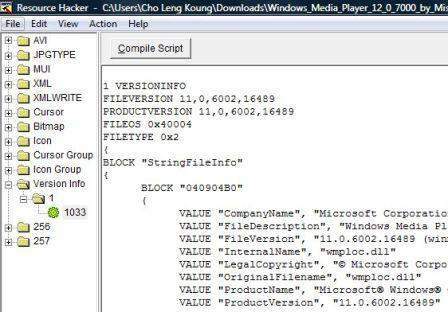 The file wmploc.dll has a version number of 12.0.7000.7000 where 11.0.6002.16489 is expected. Do you want to install the Player from Microsoft Web site? The wrong wploc.dll version error is a common problem that usually affects users who install a new Windows Media Player skin by replacing original “wmploc.dll” file in “\Windows\System32” folder. wmploc.dll dynamic-linked library file stores most of the graphical user interface (GUI) resources for WMP, and wmploc.dll provides an easy way to customize WMP skin as existing resources (graphics) can be replaced with custom-designed or custom-made one to change the UI. WMP checks the version number of the wmploc.dll file every time it’s started, and the error message will appear if the file version of wmploc.dll and WMP itself is different. WMP requires wmploc.dll to have the same version with wmplayer..exe in order to work properly. To fix the incorrect wmploc.dll issue, simply replace back the original wmploc.dll file if you have accidentally overwrite it. Otherwise, reinstall Windows Media Player can help to resolve the issue too. For users who want to keep the new customized, modified or edited wmploc.dll of another version, follow the step-by-step guide below to fix the versioning issue. Download and install Resource Hacker. In the right pane, modify the all instances of the version number with the correct WMP accepted version number. For example, in the error above, 12,0,7000,7000 and 12.0.7000.7000 in the wmploc.dll is wrong or invalid, and should be replaced with 11,0,6002,16489 and 11.0.6002.16489. The resource instances to change include FILEVERSION, PRODUCTVERSION, FileVersion and ProductVersion. For FileVersion, only the initial part of version build tag need to be modified. Click on Compile Script button when done, and then Save the file. Run the Windows Media Player again.